Aeromotive fuel filters feature an advanced flow-through design to allow for steady fuel flow with less than a .15 psi pressure drop. Designed for carbureted or fuel injected engines from 200 to 3,000 hp, they're made from 6061-T651 aluminum alloy with the impeccable machining and finish you've come to expect from all Aeromotive components. Designed to stand up to the destructive properties of alcohol based fuels, including ethanol and methanol. High-flow, 40-micron stainless steel, cleanable element. ORB-10 ports. Fittings available to adapt these filters to AN-10, -08 and -06 line sizes. Compact size: 5.5' long x 2' diameter. 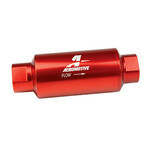 Features an anodized bright dip red finish for a corrosion resistant, show car quality appearance.